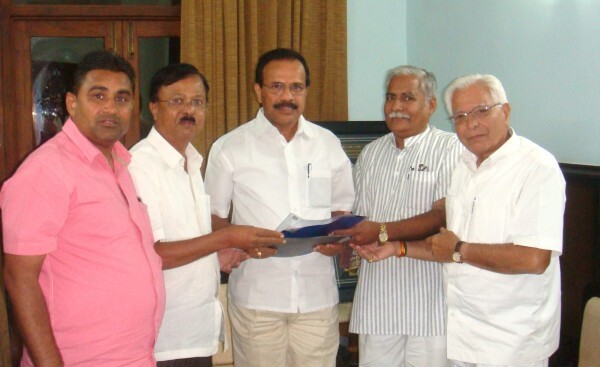 The Chambers President Shri.Rajendrakumar Harkuni met, Hon.Railway Minister Shri.D.V.Sadanandgowdaji on 24th of June 2014 at Karnataka Bhavan Delhi and submitted the detailed requirement of Railway infrastructure and new rails from Belgaum. The Hon.Railway Minister Shri.D.V.Sadanandgowdaji assured the delegation, he will consider on priority basis Belgaum-Bangalore, Hubli-Mumbai train daily and other trains. Give priority to Belgaum – Dharwad line in the coming budget as it would save the travel time to Bangalore from the current 12 hours. Speed up the construction of railway over bridges in the city. Out of the 5 required 2 have been sanctioned, the minister was urged to expedite the process on the 2. Railways urged to approach traders to make use of freight services of the Railways. The inland container depot at Desur is under utilized as of now. Entry and exit points from both sides to Belgaum railway station was also demanded. Vending machine for platform tickets was also sought. Pre paid Auto and Taxi service must be provided at the station. Extend Chennai – Dharwad train upto Belgaum. It will fine for us if they start a daily train to Mumbai,Bangalore,delhi from belgaum station. As said by the minister that priority would be given to the Belgaum-Dharwad straight line via-Kittur is the need of the hour and a daily train from Hubli to Mumbal (Dadar or CST) is a must. Hope he does something to this part of the region and people. Belgaum chambers should have requested for Double track from Hubli to Mumbai on priority for increasing trains & reduction in travel time.